We always have a first course on the weekends – no particular reason, just long-standing habit. Having a green (or any color other than orange) vegetable for a first course works for two reasons: we get to eat something other than pumpkin and it’s a relatively low-cal first course for after the holidays. 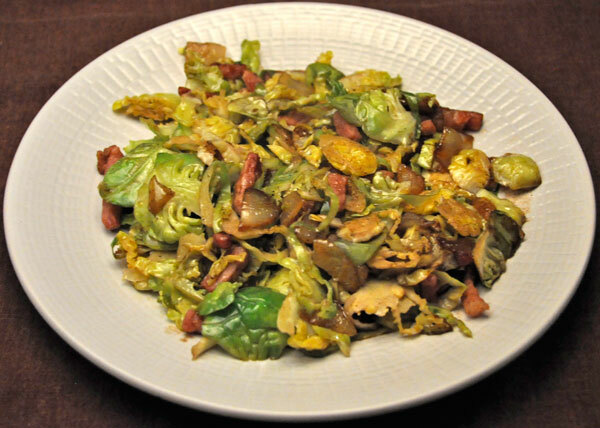 I had planned on making this salad with loose Brussels sprout leaves…. But as I got closer to the center of the sprout it was both difficult and tedious to continue pulling them off. I cut the centers in fourths…. This was a great winter / cold weather salad. Cut the remaining centers of the sprouts in quarters. Sauté bacon and shallots in 2 tsp olive oil in a medium skillet over medium heat until shallots are tender and bacon crisp.. If there is a lot of bacon fat remove some of it. Add Brussels sprout quarters and sauté, stirring frequently, until just tender, 4 – 6 minutes. Add Brussels sprouts leaves and sauté, stirring frequently, until they start to wilt. Add vinegar, good olive oil, and stir well to combine. I’ve gotten two emails this week demanding payment or I will be exposed. Apparently I have been filmed by my computer’s webcam doing provocative (and enchanting, of course) ‘things’. I am told these ‘things’ are highly suggestive and would be considered p*rnagra*phic in nature (I am not allowed to type that word). Unless I pay immediately these videos will be uploaded to my website. Or maybe it was their website…. I wasn’t reading too carefully. Anyway, one email demanded 350 bitcoins and the other demanded 582 euro. They are not very enterprising blackmailers…..
Needless to say I am very worried. I would be even more worried if my webcam was plugged in and turned on. I can’t imagine how worried I would be if I actually sat at my desk, in the kitchen, and did ‘things’ while scrolling recipes. Mon mari is being blackmailed, too. His is much more serious. He has been caught doing ‘disgusting things’. He doesn’t even have an unplugged, turned off webcam. In case you’re wondering, we both use desktops equipped with ‘dumb’ monitors. All the little goodies like speakers, microphones, cameras, etc. are extras that we have to plug into the tower. Now that I think about it…. I’m rather insulted that my video is only worth 582 euro. It does make checking my email more exciting. Wow! You’re getting off cheap! All of the blackmail emails I get are for thousands in bitcoin/euro/other odd currencies. I haven’t had my webcan on in forever. :/ I just delete them all. 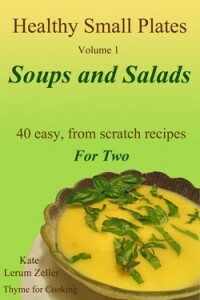 I love sprouts and this is a great recipe. Very close to what I do. I hold the sprouts by the root though and thin slice them sometimes. Gives a bit of variety. 582 is such a random number, why not round it off ??? Maybe they were going for realism… In other words: Not A Clue!!! Both of us are being blackmailed too. I don’t know how much they wanted my husband to pay, and I’ve lost track of how much I am expected to fork over. I must say that I almost think they deserve payment from us, especially for the video tapes they managed to get from my husband’s computer that has NO webcam or microphone on it. Brussels sprouts. I do love Brussels sprouts. This is a nice variation!